Interesting article on the leftbanker blog analysing the financial crisis as it is affecting Edinburgh. The Guardian had a similar piece a couple of Saturdays ago, however leftbanker goes into much more financial detail based on new revelations from the council. Leftbanker points out that there are likely to be big cuts in revenue from central government because of the billions spent on the bank bailout. At the same time rising unemployment in the financial sector in the city will mean a shortfall in council tax revenue of up to £10 million, not to mention increased benefits payouts like housing benefit. 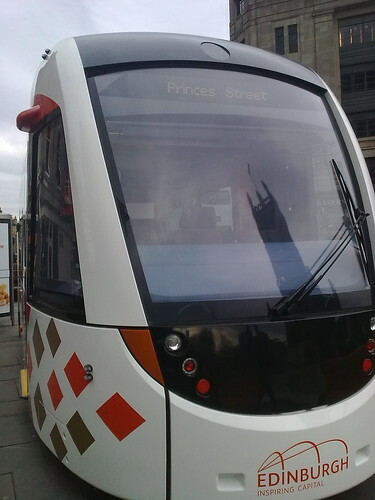 The blog also points to the cost of the new trams. The trams project faces a large shortfall. The result according to leftbanker is "This means that the City council face either blindly going ahead with the project until the money runs out. Or make massive cuts to pay for the shortfall and/or raise the council tax. They would need to make a 30% increase in council tax to pay for the shortfall in the Trams budget and the reduced council tax revenues from the effects of the recession." Leftbanker is pretty tough on the tram scheme ("The Trams project was essentially a carrot to developers to redevelop the Leith docks area with residential and commercial property. The plan was that the quick air-conditioned tram system could whisk the new well heeled residents of Leith Docks to the city centre and their highly paid jobs and exclusive shops without spending too much time in the company of the indigenous residents. It is in effect the ultimate bubble project. ")and I think this is the weakness of the article. Whilst I can accept that the tram scheme is an integral part of the attempt to build a redevelopment/finance sector based infrastructure, it would have been a positive contribution to reducing carbon emissions. In my view the left need to start getting behind some solutions as well as just pointing out the problem. In Edinburgh we have failed to do this when it came to road tolls and now the trams. The trams are certainly unpopular because, yes, roads need to be dug up to put them in place and buses diverted. But being in the minority is nothing to be scared of. Talking green is easy, acting green a bit more difficult. The problem is not trams, just that the tram scheme does not go far enough.